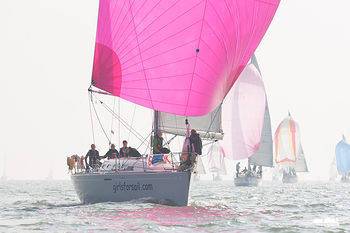 For the first time in as many years as the race team could remember, the weather gods allowed the full programme of two races to be sailed on the first weekend of the Garmin Hamble Winter Series. Which, as race officer Kathy Smalley pointed out, perhaps should be temporarily re-named the Garmin Hamble Indian Summer Series for the time being! For the preceding week the forecast had steadfastly refused to predict anything above 2-3 knots for the opening day of the 2015 series, but Sunday dawned with a light southeasterly which was to build throughout the day. All classes got underway on time helped by a sluicing flood tide, which resulted in a few individual recalls for some slightly over-keen competitors. The race team set a series of windward-leeward courses for the competing boats, which ranged in length from Swan 65 Deperado of Cowes in IRC0 to International H-Boat Bert in IRC4. As boats headed upwind to their first mark the wind was oscillating through no more than 10 degrees, meaning that boatspeed was the order of the day. But there were plenty of lead changes and tacking duels taking place throughout the 70-boat fleet. In IRC 0, Cornel Riklin's J/111 Jitterbug won both races to top the results table. The next three boats are tied, with 6 points apiece, but Richard Loftus' Swan 65 Desperado of Cowes edged into 2nd overall on countback, ahead of Louise Makin's Journeymaker II in third and Glyn Locke's Farr 280 AYBE in fourth. James Wilkie's Fast-Tack Puma won both races in IRC 1, ahead of Ian Mcmellin's Playing Around, which scored two second places. 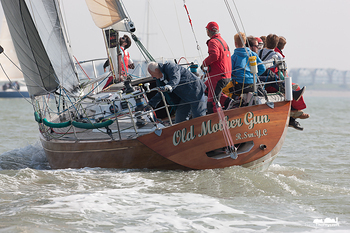 Old Mother Gun and Galahad of Cowes scored a 3 and a 4 apiece to place them on equal points. Things are tight at the top of IRC 2, where Mike Moxley's HOD35 Malice and David and Jackie Riley's No Retreat are tied on 5 points each. Mike Bridges' Elaine is close behind after scoring a 5th and a 2nd to place them 3rd overall. 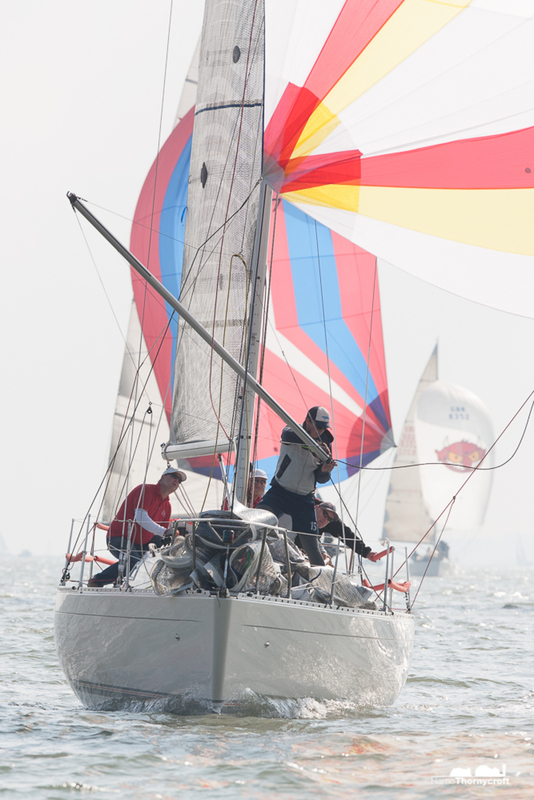 In IRC3, it was Blackjack, the J/97 of Annie Kelly who dominated, scoring two firsts. 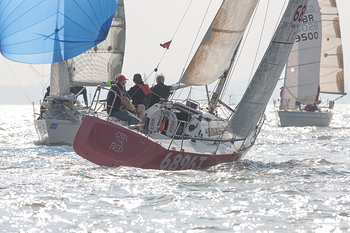 Nigel Goodhew's Persephone took second, scoring a 2nd and a 3rd, which also gave them top billing in the Sigma 38 class. 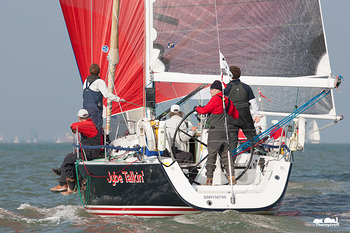 David Greenhalgh's J/92 J'ronimo lies in third place, at the top of a batch of J/92s. The Sigma 38s, racing in IRC 3, were won by Persephone, with Light in 2nd and With Alacrity in 3rd. Toby Gorman's Sigma 33, Stan the Boat, tops IRC4 after winning both races. 2nd, 3rd and 4th are currently on Equal points, with Mustang 30 Respect, Impala 28 Polly and X-95 Crakajax all scoring 6 points in a day of close racing. The Impala 28 class, which, racing in IRC4, makes up the biggest One-Design fleet, sponsored the day's racing. Polly was 1st, with Olly Bewes and George Beevor's Magic in 2nd and Peter Dessent's Vlad the Impala in 3rd overall. A packed clubhouse played host to the daily prizegiving, with prizes donated by the Impala 28 class, which is undergoing a resurgence at the club, with 9 boats racing regularly and more joining the fleet next year.Also supporting the event as official clothing partner is Helly Hansen. 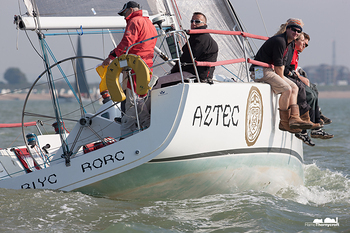 The series resumes next weekend, when it will also play host to the Hamble One Design championships and the Doyle Sails Hamble Big Boat Championships. Here's hoping the Indian Summer lasts long enough to give us good conditions – and that the tail end of Hurricane Joaquin doesn't cause too much havoc!